‘We’re at capacity, I’m afraid, it’s one in one out’ said the man with the tally counter at the door as we rolled up, fashionably late, just after 5. Through the door, Mono did look jammed, as the sweet sounds of Gerry Love’s DJ set resounded. ‘Oh no!’ we thought. ‘If it’s like this now, what chance do have of getting in later on for Edwyn Collins’ set?’ So we abandoned our plan of doing other things in the meantime (sorry, parents!) and settled for a quick shop in Monorail (via the emergency entrance around the back) before ensuring our places. The massive queues reported on Twitter earlier in the day had gone – along with the limited Lee Hazlewood LPs – but the shop was still far from its usual relaxed self. It was great, of course, to see it so busy, but I was briefly reminded of why I haven’t really done Record Store Day shopping before (my inner antisocialite). As so often, the 7" racks rewarded investigation, with Field Music’s actually, nearly, in pastiche of the first album I ever bought, Pet Shop Boys’ Actually – how could I resist that? Its covers of ‘Heart’ and ‘Rent’ are indie-ish, and ‘Rent’ somewhat lacklustre (it must be a hard song to approach), but their ‘Heart’ definitely does something right. Stephen suggested the Frànçois & The Atlas Mountains / Slow Edge split single, which I was happy to go along with (both sides are muted and tender), and thanks to Human Don’t Be Angry’s cosmic loops of rock battering the shop from the stage like an asteroid field I had to bellow at Dep to get me the Go-Kart Mozart single, spotted at the last moment on the display behind the counter. It’s a cover of Roger Whittaker’s ‘New World in the Morning’, deflated and pumped full of immaculate synth squiggles, much as you might expect, but welcome for all that. I was wondering, though – is this Lawrence’s first ever cover version? Later on, Euan was passing our table and dropped the extremely welcome hint that there was a Future Pilot AKA CD-R to be had for the asking (announced here, it turns out). Not only hand painted, but with a free herbal tea bag, honey-and-something, reckons S. ‘Sea Song’ is beautiful, and more country-tinged than previous Future Pilot outings; it’s great to think that there might be more of this kind of thing in store. So at least two of the three CDs have been spirited away to Dundee – thanks again, Euan. S. herself plumped for the Record Store Day Edwyn Collins singles box set, which earned her a wrist band guaranteeing entry to the free gig we were at anyway. Or, to look at it another way, a Monorail bracelet. At this stage I think Snowgoose were on, sounding lovely and not a little like Fairport Convention’s Unhalfbricking – full band folk, in other words, a supple sound with drumming which could be detailed or forceful, or even both, topped with Sandy Denny style proper singing (as opposed to indie not-singing singing; singing which sounded like it didn’t necessarily need a microphone). I liked them a lot, but I did start to feel, with subsequent bands Linden and Dead Flamingos, that the evening had taken a turn too far into folk music. Had Chris not been busy moving house, he would probably have been furious. Brogues’ DJ set saved the day, though, an all-Pop wander through the pick of his 7" singles, kicking off with an upbeat Caribbean take on ‘Mr Tambourine Man’ and altogether failing to come down from those surprising heights, through Saint Etienne, Veronica Falls, I guess even Crystal Stilts sounded OK in context, and building via The Loft to an unassailable peak with Glen Campbell’s ‘Galveston’ (full set list here). Edwyn was great too, of course he was. I don’t know if life really gets any more perfect than hearing ‘Falling and Laughing’ in Mono. Maybe if The Pastels had got up and sung ‘Classic Line-Up’ back at him, but that dialogue was implicit in the event anyway. I love how he announces songs now, deliberate and matter-of-fact, like they’re a solid thing he’s built, they’re safe, stacked up, achievements no-one’s going to take from him. ‘Falling. And. Laughing’. ‘You must think me very naïve...’ Yes, we still do, and it takes a lot to still be naïve after what happened to you. He crammed favourite after favourite into his half-hour slot – ‘Consolation Prize’, ‘Rip It Up’ (minus the ‘Boredom’ solo due to guitar problems – it was funny rather than awkward, though), ‘A Girl Like You’, and ‘Blue Boy’ for an encore. Y’know, the single that brought about Scottish indie pop. How else to bring a close to Record Store Day? The lesser known songs were wonderful too, especially ‘Low Expectations’, which Edwyn introduced saying that we were a great audience, but that we should lower our expectations. There was a ‘new country song’, too, which sounded well up to the mark. We will continue to expect supernovas, thanks all the same. 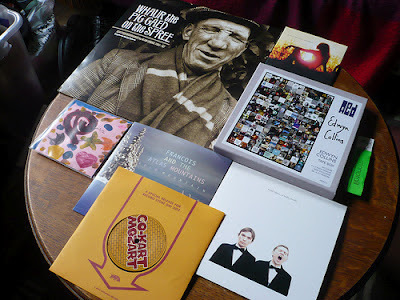 A week in England took in a couple of record shops – Manchester’s Piccadilly Records, and York’s Attic Records. The former just amazing, practically every disc annotated and a section of new stuff up front, I felt almost overwhelmed by nostalgia for non-nostalgic record shopping, the thrill of the promise of the new. Not that my selections were particularly imaginative (see photo), but the shop definitely held that promise. The sections in Vinyl Exchange, across the street, were perfectly reasonable, especially as it’s all second hand, but cards saying things like ‘90s Indie’ (with no contemporary equivalent) struck me as inexpressibly sad. It didn’t hurt that Piccadilly Records had the new Saint Etienne single in, and that the b-side is a Scott Walker song – from Tilt, I realised, playing it this evening! ‘Manhattan’ is delicate and pretty, their way, but still deeply odd, and utterly transfixing. Attic Records is so named because it’s up several flights of stairs, over a hairdresser’s. A single small room with vinyl-only stock including a nice looking box of northern soul 7"s, and elsewhere something of a Paul Kelly bonanza, with East Village’s ‘Circle’ on 12", and Birdie’s ‘Such a Sound’ on 7". It’s the only East Village record I’ve ever seen, in fact, having relied hitherto on the kindness of zip files as their one album is unavailable. No one is to tell Brogues, please, that S. and I contrived to drop it outside (she was handing me the bag, we haven’t settled to anyone’s satisfaction who let go), slightly denting the corner – it would cause him real pain, I’m sure. The other good thing about Attic Records was a fanzine it had on sale (Salt, issue 10) whose cover boasted articles on Maher Shalal Hash Baz and Royal Trux. A nostalgic tug, again (‘I wish I had a thousand bucks...’), and another reminder that these connections have to involve the present somewhere along the line. All in all, a good haul. Along similar lines, Record Store Day is coming right up. T the moment, my parents are moving house. It has caused all kinds of confrontation with things stashed in their attic, ostensibly against the day when their children have attics of their own. My hoard included the periodicals to which I’ve been subscribed since I was eight – a lot of Beanos (1984 – 1989), even more Melody Makers (1992 until its decline became un-ignorable, 1998 or so? ), and... that’s it, actually. My Careless Talk Costs Lives and Plan Bs are here, in my flat, and I don’t hold on to the London Review of Books, my current tipple (I’m doing well if I read an entire current issue, let alone revisiting past ones – and it’s all online anyway). In the early days of this LRB era, when our love was new, and hearts were high, I tried to read Tony Judt’s well-reviewed, monumental history of modern Europe, Postwar. Now, I never read history books, and have an extremely bad A-level grade testifying to my lack of interest in things which actually happened, so it shouldn’t be taken as a sleight against the book that I only made it half way through. How to sustain one’s interest when there is no protagonist, and the focus is on social trends rather than individuals, is something I still hope to learn. But it is not necessary for The Memory Chalet, a collection of memoir essays. Have I been reading the wrong one? Grant Maclennan was a subscriber, you’ll remember. Either paper, I dare say, will give the regular reader new directions to think in, because both are founded on a trick of language – they appear to be about a single subject, books, but then books can be about anything. This is what I loved about Melody Maker, too, the opportunities it took to broaden its palette, partly in terms of new music contextualised (how many new Big Star fans did their Teenage Fanclub coverage create? ), but also the way it played with the idea of contextualisation itself, borrowing from literary theory to do so (see Simon Reynolds’ Blissed Out for a distillation). Cross-fertilisation is something old, paper media does far better than the web, and a reason why subscriptions still matter. I wouldn’t feel comfortable without that thump on the doormat every fortnight, and the impetus to find out again why everything I thought I knew is wrong. Some more quotations, in lieu of the review that this isn’t. And I should say that the book is very good, full of sense, perspective and fondness, as it moves from a London childhood to academia and New York. References to the – to say the least – difficult circumstances of its composition are matter-of-fact, self pity is nowhere.